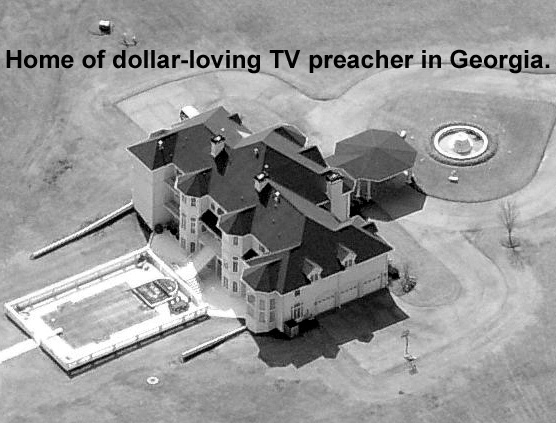 These rich people are in the worst possible spiritual condition because they were blind to their spiritual poverty, like the present-day prosperity preachers, and most Christianity in North America today. Since the rich teachers are Laodiceans, it means they are spiritual beggars, yet they think they have great understanding! How could the rich Laodiceans become spiritually rich? Only by acquiring gold refined in the fire. When gold ore is subjected to great heat, it melts and the impurities float to the top where they are scooped off, leaving pure gold. Because they have been deceived by wealth, the only way these Christians will ever be able to see and understand the truth is to suffer the fire of various hardships. Could this be the reason so many Christians in America suffer so many problems? Is God refining prosperous Christians who have become lukewarm? For example, divorce is just as high among Christians as nonChristians. It is officially higher among Christians, but that is only because so many nonChristians live together without marrying. Christians are also more overweight than the secular population, which means they are, or will soon be, suffering many health problems. There has also been economic problems in recent years that have caused some rich Christians to loose a lot of money. There have also been many natural disasters which appear to be the judgment of God. April and May of 2011 saw a record number of tornadoes, while many eastern states were having flooding and western states were having a drought along with many drought related fires. The list of trouble is very long (see the last chapter), but you get the idea. To the church at Smyrna, Jesus said, “I know your afflictions and your poverty–yet you are rich!” (Rev. 2:9) (NIV). The poor are spiritually rich because they go through much more hardship than prosperous Christians, and are therefore more likely to be strong in faith. This passage clearly states that rich people hold a low position with God. This proves that wealth is not a blessing from God! Satan is the god of this world and goes to great effort to promote materialism, but the spiritual cost is high. It is truly astonishing that people can read verses like this one and still believe that Christians should be extremely wealthy. The reason I say extremely wealthy, is because all Americans are wealthy when compared to the rest of the world. The web site, Global Rich List, http://www.globalrichlist.com, reveals the truth about American wealth. A family earning $40,000 has an average income in the U.S., but is among the top 3.17% of the world’s richest people. The uninsightful person may want to argue that the Communists were all poor, so why didn’t Satan make them wealthy too? Satan uses different tactics, depending on the circumstances. Satan tried to slaughter all the Christians in the U.S.S.R. and other places, but in the U.S. Satan is using materialism to destroy Christians, and is having great success. Before I traveled to the West I had absolutely no idea that so many churches were spiritually asleep. I presumed the Western church was strong and vibrant because it had brought the gospel to my country with such incredible faith and tenacity. Many missionaries had shown a powerful example to us by laying down their lives for the sake of Jesus. On some occasions I’ve struggled while speaking in Western churches. There seems to be something missing that leaves me feeling terrible inside. Many meetings are cold and lack the fire and presence of God that we have in China. In the West many Christians have an abundance of material possessions, yet they live in a backslidden state. They have silver and gold, but they don’t rise up and walk in Jesus’ name. In China, we have no possessions to hold us down, so there’s nothing preventing us from moving out for the Lord. The Chinese church is like Peter at the Beautiful Gate. When he saw the crippled beggar he said, “Silver or gold I do not have, but what I have I give you. In the name of Jesus Christ of Nazareth, walk!” In a similar way, I pray that God might use the Chinese church to help the Western church rise up and walk in the power of the Holy Spirit. . . .
Multitudes of church members are satisfied with giving their minimum to God, not their maximum. I’ve watched men and women during offering time in church. They open their fat wallets and search for the smallest amount they can give. This type of attitude will never do! Jesus gave his whole life for us, and we give as little of our lives, time, and money as we can give back to God. What a disgrace! Repent! This may sound strange, but I even miss the offerings we used to give in China. Did you notice anything? He said he expected the American Church to be alive, but he found it dead. Jesus said the same thing: “‘I know your works. You have the reputation of being alive, but you are dead” (Rev. 3:1) (ESV). The reason the Western Church has backslidden is because it has been deceived by false doctrine and prosperity. The Western Church believes it has been given wealth as a reward from God, but the wealth should be given to Christians in other nations who do not have enough to meet their needs, and to preach the Gospel in Asia and Africa. Western missionaries are no longer allowed into most Asian nations, but they are actually not needed. There are enough Christians in most nations today who are able to train and send out their own missionaries, the problem is they are poor, so they do not have the funds to support the native missionaries. Gospel for Asia has thousands of missionaries who have planted thousands of churches, but there are still 500,000 villages in India without a church. There are many native missionaries waiting to go, but they are waiting for the funds to come from American Christians. Far too many of the churches in America only want to support missionaries who are part of their denomination, so they will not support Gospel for Asia. There are 42,000 children enrolled in schools through Gospel for Asia. The children are also taught about Jesus, which often leads to the conversion of entire families. But there are 11,000 children waiting for sponsors! American Christians have enough money to enroll all of those children. Let us hope that at least some of the American Church is able to repent of its greed and start sharing. Here again it is clear that life’s riches can choke out the truth of God’s Word! If the riches of this world can choke out the Word of God, then Christians should be very careful about not having a lot of those riches. As it stands now, the gold-loving preachers do not believe the above statement, and preach that Christians should be millionaires. We have seen through several Bible passages that having wealth is very dangerous to us spiritually, yet the gold-loving preachers want us to become wealthy. Satan is the one who wants Christians to become wealthy because he knows the harm it will do us. Many rich people actually live cursed lives, such as J. Paul Getty who had one child die of a brain tumor, another committed suicide at age 48, another became a drug addict. His granddaughter Irene said, “I hate money… I don’t want to be a Getty” (Interview on Dateline NBC, 1996). Irene was a drug addict with Aids. Her brother suffered a drug overdose and became nearly a vegetable. Many rich people have lived the same kind of nightmare. Today, there are more wealthy people in the United States than ever before. There are more than 1,000 billionaires, 49,000 with a net worth of 50-500 million, 125,000 with a net worth of 25-50 million, and 9 million worth one million. According to The Millionaire Next Door, 3.5% of all American households have a net worth of over one million dollars (p. 3). Many of the super rich do not plan to leave all their wealth to their children because they know the harm that it does, so they are giving away billions of dollars to hospitals, universities, and other charities. Oscar Shaffer, a rich hedge fund manager, is one of those who believes the rich should leave their wealth to charities. He said, “I know a lot of people, sons and daughters of wealthy people, who’s wealth has basically crippled them” (Untold Wealth: The Rise of the Super Rich, CNBC, 2008). Even people who win the lottery suffer greatly in so many ways that most of them wish they had never won. This is so frequent that it is referred to as “the curse of the lottery.” Several TV documentaries have been produced and articles written detailing the trouble that follows lottery winners. Even though this family was confirmed Christians, the money destroyed them. Another Christian was Billie Bob Harrell Jr. who won 37 million dollars in the Texas Lottery. He had so many problems he ended up committing suicide. Daryl LePage said, “When you win a large sum of money, you would think that your problems go away. In reality, a new set of problems come in.” Yet, people are gullible enough to believe that God wants them rich! Stop listening to those lying servants of Satan! Those lying snakes, wolves in sheep’s clothing!